CUFI | Open Our Eyes, Lord! Seminario ESEPA held a conference in 2014 on the topic of “Israel and Palestine.” They asked me to be one of the participants; I offered the following thoughts, which I have updated a bit, with the warning that they come from a Bible student with only cursory knowledge of world affairs. Good evening, and thank you for allowing me to participate tonight, alongside of my esteemed colleagues. 1. Where are the answers? Second – our other, corresponding, gospel truth is from Romans 11, which speaks of the olive tree, in which Gentile believers have been “grafted.” But in his conclusion, Paul adds a surprising note in Rom 11:23 – “And if they do not persist in unbelief, they will be grafted in, for God is able to graft them in again” and 11:26 – “and in this way all Israel will be saved.” I take this passage, admittedly a difficult one, to predict a universal conversion of Israelites to Christ as an eschatological even at or around the Second Coming. Paul does not, however, speak of a return of Israel to the Land in unbelief, nor of any mandate to control both halves of Jerusalem, nor the need or desirability to build a Third Temple – the temple he is concerned with in his letters (1 Corinthians, Ephesians) is the temple that is the body of Christ. 2. How does the Bible help us to solve modern questions about the Middle East? I am not at all convinced that current events in the Middle East are specifically predicted in the Bible; that is to say, I see little to nothing in the prophets that speaks directly to 2017, the Israeli-Palestinian conflict, ISIS, Iranian nuclear development, Iraq I, Iraq II, Afghanistan, and so forth. 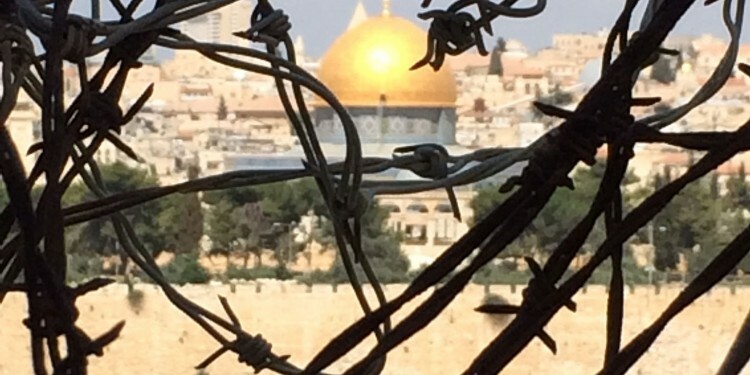 Taking the two truths described above as a basis, I will offer some brief thoughts to some of the main questions regarding Israel and Palestine, and will conclude my time with a positive suggestion. I will focus on Israel, because that’s the side that seems to interest my fellow Christians tonight. Should Christians defend Israel, just as some hid Jews during the Holocaust? I say that, yes, Christians are always obligated to defend the persecuted. If we are speaking of Nazi persecution, we would have been under the solemn obligation to defend and protect the 6 million Jews and the 5 million non-Jews, which included Slavs, Catholic leaders, Gypsies, the mentally and physically handicapped, and – oh, yes! – Jehovah’s Witnesses and homosexuals. When ISIS looked about to exterminate thousands of Christians and Yazidis in August 2014, it was our obligation to pray for and aid all of them, despite the fact that theologically we Christians have been at odds with the Yazidis for almost 2000 years. Does the modern state of Israel have an absolute, immediate right to annex all the territory God promised to Abraham, which would include not just all of Palestine but also parts of Egypt, Jordan, Lebanon and Syria? I say no. In Genesis 15:18 God says to Abraham “To your descendants I give this land, from the river of Egypt to the great river, the river Euphrates.” This is repeated almost wholesale in Joshua 1:4 – “From the wilderness and the Lebanon as far as the great river, the river Euphrates, all the land of the Hittites, to the Great Sea in the west shall be your territory.” There are people who say that if Israel allows even a square meter of the West Bank to be under Palestinian control, then it is acting out of wickedness and unbelief. For example, in 1967 Rabbi Tzvi Yehuda Kook argued that all land west of the Jordan had to be occupied by Israel: “Yes, where is our Hebron? Have we forgotten it? And where is our Shechem? And our Jericho? Will we forget them? And the far side of the Jordan, it is ours, every clod of soil, every region and bit of earth belonging to the Lord’s land. Is it in our hands to give up even one millimeter?”[i] To this I must say No. Israel has never in any one moment of time occupied all of the territory of these two texts; so why, all of a sudden, do they have to, are they obligated by God to, occupy Palestine and not, one should hasten to add, the areas of Jordan, Syria, Lebanon, Gaza, and Egypt that are also implied?